Marine Le Pen, leader of the fascist Front National, would beat current president François Hollande if the French presidential elections were held tomorrow, a new poll has revealed. This is the first time a poll has shown a potential victory for the fascists in the crucial second-round run-off. This is a threat that cannot be ignored. At the end of July, an earlier poll put Le Pen in the lead in a first-round presidential vote, ahead of Hollande’s Parti Socialiste (roughly equivalent to the Labour Party in Britain) and the conservative UMP. That was worrying, but perhaps not surprising – the survey of voters’ views came on the back of the FN’s success in May’s European elections when it came first with 25% of the vote, its best ever position. In France, if no candidate wins an overall majority in the first round, the top two candidatesface off against each other in a second round. But the July poll did not show how the FN leader would do in a second round of voting – the decider in who becomes president. Now we know. This week’s Ifop poll reveals that the danger of Le Pen making a successful bid for the presidency in April and May 2017 is very real. It showed that Le Pen would beat Hollande, by 54% to 46%, if the two faced off in a second-round election. Such an outcome would give France a fascist president. The poll sets out three different scenarios in which the conservative UMP would face the FN leader, based on which of three potential candidates the conservative party stands. It found that all three would beat Le Pen – former president Nicolas Sarkozy would win by 60% to 40%, with former prime minister Alain Juppé set to win by a greater margin – 64% to 36% – while François Fillon, also a former prime minister, would beat Le Pen a narrower 57% to 43%. But these figures would represent a huge gain for the fascists, massively up on its vote in the presidential elections in 2002 – the only previous occasion it has made it to the second round – when conservative Jacques Chirac took 82.21% to the 17.79% secured by the then leader Jean-Marie Le Pen, Marine’s father and still the FN’s honorary president. The poll shows that Le Pen would go into the second round in the lead after the first round vote, leaving candidates from all other parties trailing. The FN leader would take between 28% and 32% of the first round vote – up on its 25% in the European elections – with only 16% to 17% of voters choosing the PS incumbent Hollande. The UMP’s vote would depend on whether the UMP puts up Sarkozy (25%) Juppé (24%) or Fillon (17%). A run-off between the UMP and the FN is the likeliest scenario for the second round, according to these polling figures. But they show that if Fillon is the UMP’s candidate, a second round battle between Le Pen and Hollande is also a possibility – Fillon and Hollande are neck and neck, each favoured by 17% as a first round choice. Worryingly, the projected increase in Le Pen’s vote between the first and second round in the event of a run-off against the UMP suggests that initial voters for parties to the left of the UMP – including the centrist Modem and possibly the PS too – would switch their votes to the fascists. Le Pen’s unprecedented polling figures come as voters react angrily against the betrayals of PS president Hollande, who has continued the regime of austerity and cuts imposed by his UMP predecessor Sarkozy. The PS vote collapsed to just 14% at the European elections. Hollande’s presidency is in crisis and the PS in disarray. The radical left has been unable to present a credible alternative, although the Ifop poll suggests that the leftwing Front de Gauche’s Jean-Luc Mélenchon would take 10% in a presidential election – an improvement on the coalition’s 6.34% in the European elections. At the same time, the conservative UMP is mired in financial scandals over election spending and wracked by internal disputes. It is currently leaderless – Juppé, Fillon and yet another former prime minister, Jean-Pierre Raffarin, jointly holding the reins until an extraordinary conference in October. Hollande has also followed Sarkozy in making concessions to racism, particularly targeting Muslims and Roma people, whose camps have been violently broken up. These concessions by the mainstream parties have only encouraged and legitimised the racism of the FN – its big pitch to voters. Le Pen, far more adept than her father at presenting a glossy acceptable image and hiding the FN’s fascist politics, is moving into the political vacuum created by the crisis of French politics, feeding off the misery of austerity and lifted by the increasingly racist climate. Across Europe, racist and fascist parties made big gains at the May elections. 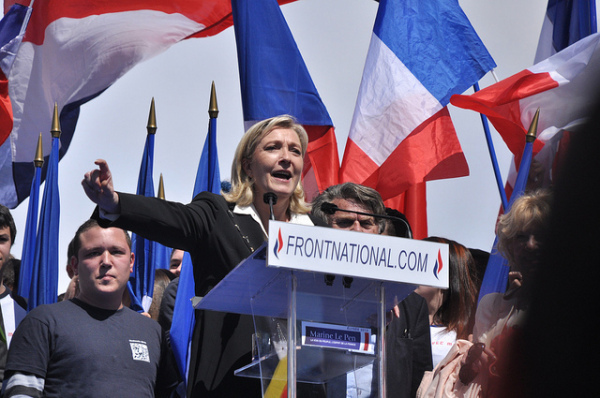 Le Pen is already the most successful of the lot – and the FN’s rise gives confidence to the far right across Europe. Now the Ifop poll shows that Le Pen could be at the very least a strong challenger in the 2017 presidential election – or she could win it. That is the gravest danger: a fascist president in France, at the heart of Europe. No time must be wasted in setting up a united anti-fascist organisation in France. Build in the unions, in the mosques, among the students …. as wide as possible.